The amazing part of purchasing this incredible cheap ticket is that Paradiso Ubus actually credit’s the 50k you paid per movie ticket towards the restaurant bill!!! That’s right! So if you purchase food and beverages during the movies and your total bill is for example 80k you only end up paying at the end of the movies 30k (80k less 50k from the already paid movie ticket). I think this is just amazing! 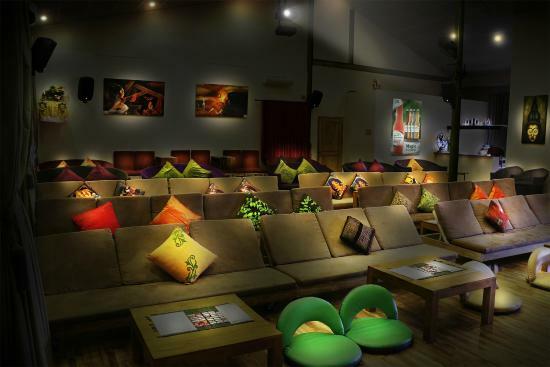 There is a huge choice of vegan, vegetarian and even raw vegan food options that is served and prepared from Earth Café which is part of the Cinema complex. On the menu Earth Café outlines what meal is vegetarian, vegan or raw vegan. The delicious veggie burrito is made with whole meal tortilla and filled with brown rice and roasted veggies and hummus dip. Healthy, wholesome and just tasty to the max! 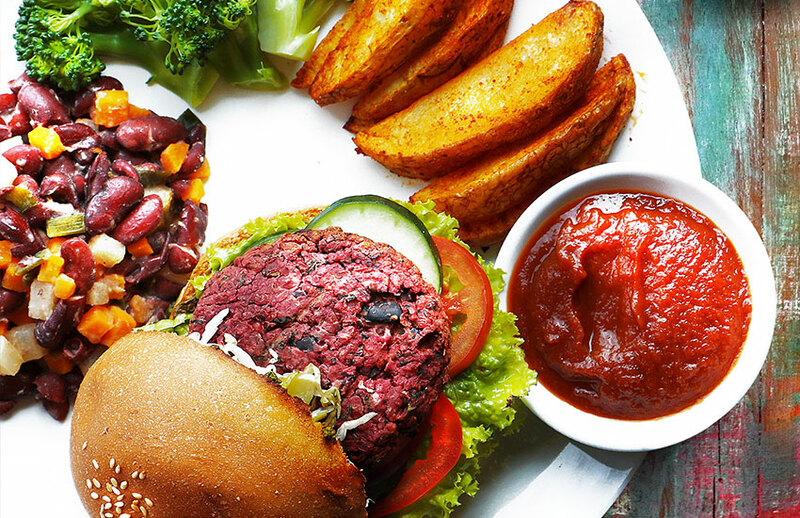 The vegan bean burger is made with a white burger bun and layered with lettuce, tomatoes, onion and chickpea patty. The burger is topped with hummus dip and served with homemade tomato-sauce and some potato wedges. The burger was also delish, however they could have served some more fries. But for this you can order side dishes! OMG this was my favorite and I certainly ordered it a few times whilst I stayed in Ubud over the 6 weeks!!! The salad mostly consists of raw veggies and is served with cold Udon noodles, guava fruit and a very nice homemade citrus dressing. Just finger-licking-good and so super healthy!!! Check out Earth Cafe’s website to find more info;s abou their absolutely healthy and delicious foods! As you walk into the cinema you will find seats without tables and seats with tables. On the tables you will find the food and beverage menu. Before the movie seats waiters will come to your table and take your order. The friendly staff then brings the food to you after the movie starts and you eat whilst watching the movie 🙂 If you want to order more during the movies such as a dessert all you need to do is lift your hand into the air and a waiter will come and take your order. At the end of the movie they bring you the bill to the table and you give them your movie ticket to credit you the 50k and pay. 3. It is dark when you eat which is a little disadvantage in my opinion as I love to see my food whilst I am eating but it still is an experience and yummy! I absolutely loved it. The whole idea of dining and watching a movie in general is amazing and adding to this you also get to chose from a huge variety of vegan and raw vegan foods with is an additional bonus. Then you get some nice AC which is a reprieve from the super hot weather too! Go and check it out when you are in Ubud because it’s definitely worth it!!! The food was yummy and healthy and it was just a different movie experience from the conventional movie theaters you are used to. Read to travel for delicious vegan food? Looking for affordable flight tickets to Ubud Bali? Then check out great deals on international flight with Skyscanner.com. My favorite way of finding the best and cheapest dates to fly is by using Google Flights as they have an amazing calendar showing you the cheapest dates to fly. AirAsia is an Asian low cost airline that fly’s for very little money from Australia, Kuala Lumpur, Bangkok or Singpore to Bali as well but I personally prefer flying with larger airlines. But this is my personal opinion of cause. For more tips on how to save money on flight tickets check out my page “cheap flights”. Are you also looking for an affordable place to stay in Ubud? Hair Loss: Why woman also lose their hair!